A late flurry of tries from Old Elthamians against Chinnor made sure their sensational season continued as the league leaders remain five points clear of second-placed Ampthill and District, who saw off Cinderford. 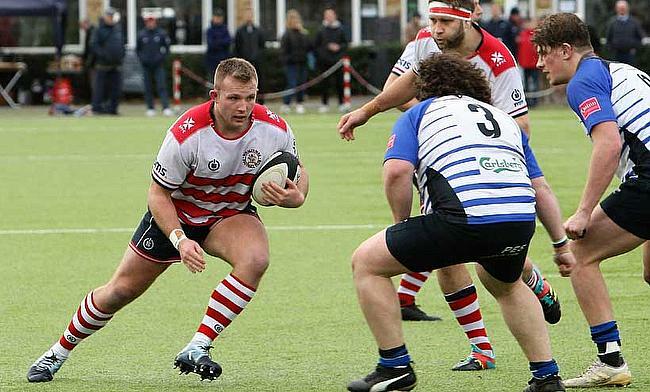 Third-placed Blackheath fought hard to secure their first win in just under a month as they beat Birmingham Moseley while Rosslyn Park produced a superb first-half display against Sale FC , which helped them to victory at the Rock. At the wrong end of the table, Caldy picked up their first win since December as they edged past Cambridge and the Wirral outfit were one of only two sides in the bottom half of the table to taste victory on the weekend. Elsewhere, Rotherham Titans came from behind to beat Esher, Bishop’s Stortford hammered Plymouth Albion and Darlington Mowden Park shrugged off a spirited Loughborough Students side. Old Elthamians maintained their five-point gap at the top of National One following a hard-earned victory over Chinnor. After Craig Holland had kicked a penalty to give the visitors a 3-0 half-time lead, OEs centre James Golledge touched down just five minutes into the second period. OEs’ pack then provided a platform for their second score on 70 minutes as George Perkins went over before quick-fire tries from Dom Lespierre and Golledge wrapped up the bonus-point win for Gavin Lach’s league leaders. Ampthill and District survived a spirited second-half fightback from Cinderford to clinch a bonus-point victory in Gloucestershire. The A’s led 21-3 after a solid first-half display as Will Allman (2) and Jon Kpoku both touched down, while Dan Pointon landed a penalty for the hosts. After the break, Cinderford sparked into life as a score from Reuben Norville and a penalty try brought Paul Morris’ side right back into the contest. Sam Smith then finished off a superb Cinderford move to reduce the deficit to a single point, but as the clock went red, Ampthill sealed a potentially vital bonus-point as Tadgh McElroy scored in the last play of the game. Blackheath battled to a welcome victory against Birmingham Moseley to reignite their title hopes in National One. ‘Club’ twice went ahead in the first period thanks to tries from scrum-half Jack Daly and winger Elliot Clements-Hill. The hosts did respond with two scores of their own, but Moseley fell further behind in the second period when Tom Williams barged over. Moseley hit back once again to reduce the gap to five points, but Clements-Hill’s second try of the afternoon sealed a bonus-point victory for Blackheath and ended a three-game losing run. Rosslyn Park edged an entertaining National One contest at the Rock as they held off a late surge from Sale FC to stay firmly in the promotion picture. Park led 7-0 after an early Bam Fadahunsi try before the first of Paolo Odogwu’s two scores saw Sale level. But the hosts led 28-7 at the interval after tries from Joe Munro and Hugo Ellis (2). Jack Moorhouse’s effort shortly after half-time gave Sale an excellent start to the second period, however, they were unable to trouble the scoreline again until the final three minutes. Oli Grove landed a penalty for Park, but Sale were able to leave the capital with two bonus-points as Johnny Leota and Odogwu both dotted down. Seb Nagle-Taylor scored a hat-trick as Rotherham Titans came from behind to beat Esher in Yorkshire. Nagle-Taylor scored his trio of tries in the second-half, but Rotherham trailed 12-5 at the interval as scores from Dan Rowland and Matt Lowes cancelled out Richard Stout’s early effort. But, Nagle-Taylor came off the bench to give Rotherham the lead before the hour and the No.8 completed his hat-trick on 72 minutes as Joe Barker’s side returned to winning ways. Bishop’s Stortford’s fine form continued as they secured a superb victory over Plymouth Albion at Silver Leys. Andy Long’s side ran in nine tries and turned the screw in the second period after Stortford had led 26-12 at half-time thanks to two scores apiece from George Cullen and Nick Hankin. After the break, Matt Tomlinson, Joss Linney, Seb Brownhill and Tom Banks all touched down before Stortford put the gloss on proceedings when the returning Baxter Wilson scored late on. Albion could only manage tries from Seta Raumakita (2), Jamie Salter and Dan Swain on a tough afternoon in Hertfordshire. Winger Callum Mackenzie scored a hat-trick as Darlington Mowden Park inflicted a defeat on bottom of the table Loughborough Students. Two Jack Moates tries and a score from Tim Bitirim gave the Students a 17-14 half-time lead, with Mackenzie going over twice for the hosts. Charlie Reed kicked the away side further in front after the interval, but Mackenzie’s hat-trick gave DMP the edge. Reed’s second penalty of the afternoon put Loughborough ahead once again, however, DMP clicked into gear as Chris McTurk and Ben Frankland both went over to give the hosts some breathing space for the first time. Loughborough continued to battle as the impressive Moates sealed his hat-trick, but DMP had the final say when McTurk and Matt Heaton both crossed to seal the victory for Danny Brown’s side. Caldy secured a much-needed win against Cambridge in a tight National One encounter at Paton Field. Tries from Jack Higgins and Kwaku Asiedu meant Cambridge held a 12-3 lead at half-time after Ben Jones had originally kicked Caldy in front. But two tries in nine minutes proved decisive as Nick Royle and Rhys Hayes both went over in an encourging second-half for Caldy, who tasted victory for the first time since the beginning of December.